WARSAW – U.S. Secretary of State Mike Pompeo said Thursday it is impossible to achieve peace and stability in the Middle East without confronting Iran. Netanyahu is also set to meet with U.S. Vice President Mike Pence during the convention. U.S. President Donald Trump’s senior aide and son-in-law Jared Kushner is also attending with Trump’s Mideast peace envoy Jason Greenblatt. The two are set discuss the economic aspects of the peace plan with Netanyahu and Arab leaders. Kushner will also hold a public discussion over the plan with former Norweigian foreign minister, Børge Brende, marking the second time Kushner will discuss the plan in public. The Polish Foreign Ministry announced two days ago that about 60 countries had confirmed their participation in the event, including Arab nations. Besides Oman, representatives from Saudi Arabia, Bahrain, Yemen, Jordan, Kuwait, Morocco, the United Arab Emirates, Egypt and Tunisia were attending. On Wednesday Netanyahu met with Omani Foreign Minister Yusuf bin Alawit who hailed a “new ear” for the Middle East and thanked him for his country’s Israel policy. “The courageous decision of Sultan Qaboos to invite me to Oman is changing the world,” Netanyahu said. 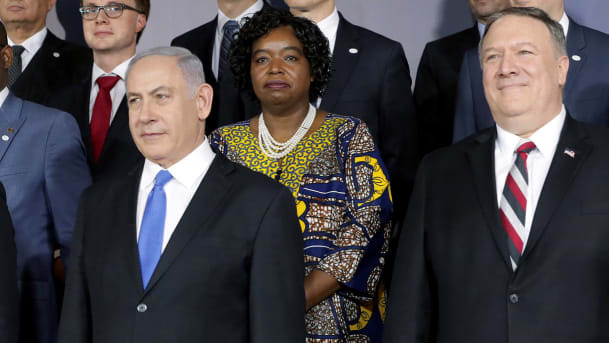 Relations between Israel and a number of the countries on the list have warmed considerably in the past year, and with three of those countries to a point where Netanyahu has been particularly interested in upgrading relations with them: Saudi Arabia, Bahrain and Morocco. Iranian representatives did not participate in the conference, and the Palestinians also announced that they were boycotting it.